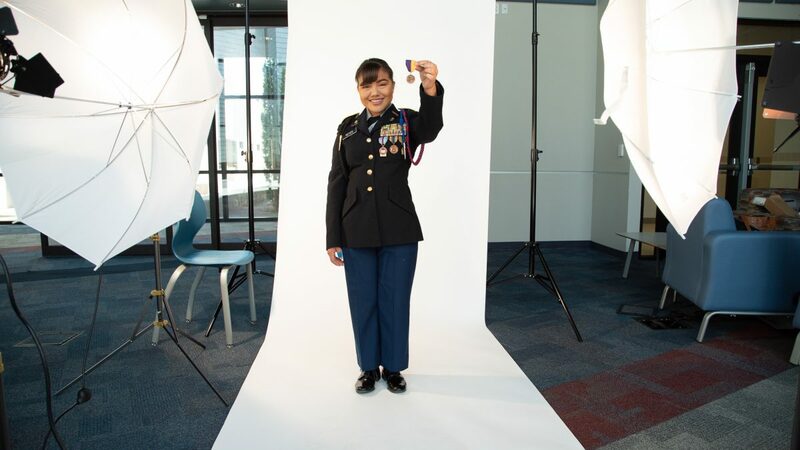 Honesty Reyes of Las Cruces High School shows off decorations earned as an ROTC cadet. She is one of 45 students interviewed in our soon-to-be-unveiled student voices project. Future Focused is listening. Before talking to legislators or releasing white papers, we’ve decided to interview the experts: the students themselves. How do they learn best? What would they change? These questions took us on a statewide interview tour, visiting eight schools grades K-12, and talking with over 45 students. While traversing New Mexico, I conducted interviews in classrooms, counselor’s offices, conference rooms, supply closets, and gymnasiums. We asked about student engagement in learning and their experiences with assessment. What emerged was a pervasive, resonating voice: they need better ways to measure what they are learning. Students spoke keenly to the school-wide anxieties triggered by standardized testing and how they valued other means for relating what they know. In listening to these diverse voices describing their most valuable learning experiences, I was moved to hear how much they yearn for creativity in the classroom. They felt empathy for the struggles of their teachers to conform to a system that is choked by standardized curriculum, often void of art and self-expression. Students throughout New Mexico most appreciate learning that involves collaborative group work, hands-on projects, and the opportunity to present what they have learned. They felt that by being able to choose a topic, conduct research, and then do a presentation on their learning, they were able to not only learn deeper, but also better retain their knowledge. These types of learning experiences were cherished and remembered by the students because they had to “think on their feet” and be ready to answer questions spontaneously from their peers and the teacher. They also gained a level of self-confidence from creating and doing a presentation that they wouldn’t have experienced by simply taking a standardized test. The students spoke extensively about individual creativity as a source of inspiration. “When I am able to use art to show what I’ve learned, I feel there’s more opportunity for me,” said one student. The biggest takeaway that I gleaned from listening to students talk about their project presentations was that they felt immense pride and that they owned their work. The students were all very courageous during their interviews. I witnessed how the ability to express oneself creatively during a classroom or school-wide presentation lead to students overcoming the vulnerability of self-expression. I was struck by the thoughtfulness of their answers and the adamance in their voices. The benefits and value for hands-on projects with peers, creative presentations, and the stress brought on by standardized testing were common threads of discussion for every student interviewed. They all spoke of a future for education that would be inclusive of student learning differences, not something forced upon them in which they would need to fit or fail. Future Focused is excited to unveil the full scope of the student voices project soon. We believe by listening first we can create better education policy to help the students who need it most. Visit the online version of the gallery here. See the touring exhibit in action on Facebook.